Antique half morocco and wooden boards, gilt title on the spine. 336 of 352 leaves, wanting a10, b1-3, b9-10, and KK10; blank space for initials, sometimes filled in by hand; some early marginalia notes. 1. 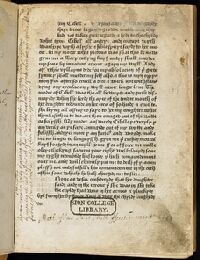 MS exlibris of Matthew Forster, 1646 (fol. 14). 2. Gift to Sion College by Matthew Forster, son of Captain Matthew Forster, merchant of London, 1646. 3. Sion College Library, Sotheby's 13 June 1977, lot 36. 4. H. P. Kraus Catalogue 200, 141. (Cf. Mostly British, p. 107).